We attended Dixon Stage Left's production of "Marriage is Murder" the other evening. First off, what a great addition Dixon Stage Left has been to the community. If we are counting correctly, this is its third season. And all three have been filled with presentations varied and entertaining from a night with the Scott Stevenson Jazz Trio to thought-provoking all-female "Vanities" and painful "Rabbit Hole" to tongue-in-cheek production "39 Steps" to the dizzying four-people-playing-a-gazillion-roles in "The Complete Works of Shakespeare, Abridged" to free showing of Halloween films, like "Rocky Horror Picture Show" to comedy "3 Doors on the Floor" -- homegrown skits a la SNL or Chicago's Second City, and Neil Simon's "Barefoot in the Park" to a new production of "A Christmas Carol" which was anything but old and tired. But we digress. Carolyn is continually surprised when people say they have not heard of Vassar College, but not because they should have known it, just like they know of Harvard Yard or Yale locks or Ohio State Buckeyes, but because Vassar is in every other piece of literature or performance (play or film) encountered. and so on and so on. This fact includes Dixon Stage Left's "Marriage is Murder," now playing and still with performances scheduled for 25, 26 & 27February 2016. Paul (who did not attend Princeton -- where?) complains about ex-wife Polly's long-distanced and long-winded telephone conversations with the hated Ellen, a classmate from Vassar who is as bossy, know-it-all and professionally successful as Polly must be. 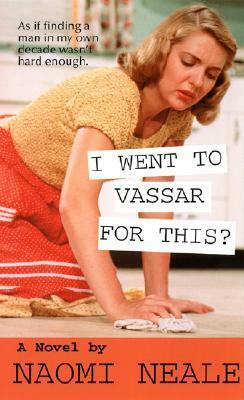 Even Lisa Simpson had something to say about Vassar. Even as Vassar is or maybe because it is the only Seven Sister college (seven East Coast colleges which traditionally had all-female students) to go "co-ed" and admit men, these myths endure. It is not at all clear whether Vassar attracts all of these types or all of these types are attracted to Vassar. Wiser persons than we have wrung their hands and wondered why. And, do you know, Vassar deserves every bit of the press it has received. It is all this and more. Vassar is a place for contemplation, for learning how to think, for questioning authority, for acting up and acting out and simply acting (Meryl Streep, Lisa Kudrow, Jon Tenney, et al notwithstanding -- Vassar has an actual Drama Department), and for being open to possibilities. It is not perfect and it is very contradictory. The only wrong impression that people have about Vassar which needs correcting is: Vassar is not in Boston, or Cambridge or even Massachusetts.